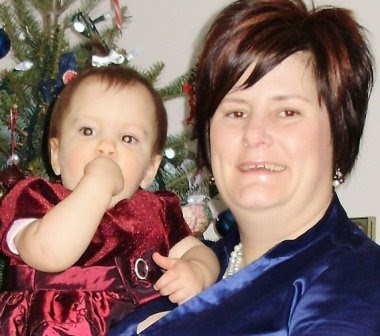 Emily is in Grade 2 and will be making her First Holy Communion this Sunday in Moncton. 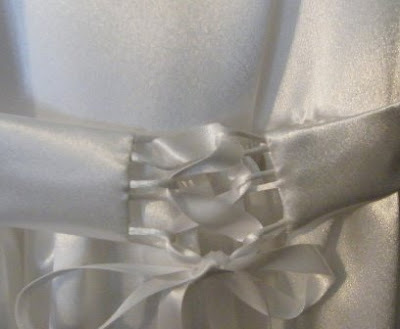 I've been working on her beautiful white satin dress all week. I won't show you the dress yet, because I want Emily to see it first. On Sunday, I will take a nice picture of her at her First Communion and show you wearing the dress. In this photo, I'm just hand stitching down the inside lining to the zipper so it will have a nice smooth look in the back. Since the dress pattern is made to be roomy, this little couture sash will be perfect to adjust for a small little frame. It can be laced up in the back or the front. I'll let Emily decide. Congratulations Emily. We'll see you in a couple of days. It was 34 years ago, that while at home doing some housework, my waters broke. I knew it would be soon that I would have my precious little baby. Knowing that I would be in the hospital for a week, I rushed around the house to iron up a few things, ran to the store to buy a new purse, and then went to the hospital in the afternoon. The next day 4:11 in the afternoon, Patience Louise was born. And now my baby Pa., has her own baby A. Have a great day Pa. I hope good things come in three today. I have the first two already!! First: My good friend LindaH sent me an email congratulating me on my blog win at Ribbonsmyth's Blog. See, I go to her blog from Linda's blog. Does that mean I have to share the prize!!! I didn't know that I had won until Linda told me. Wow, that's exciting. I had intended to do a bit of ribbon shopping at the Ribbonsmyth online website, but put it of, just in case I won the blog give-away. And now I won. That's the power of positive thinking isn't it. Many thanks Ribbonsmyth!!! 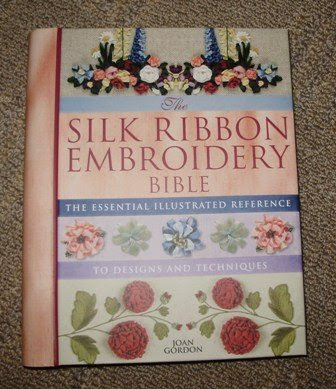 Second: In today's mail, I received my Silk Ribbon Bible, by Joan Gordon, that I ordered from Chapters books a couple of weeks ago . 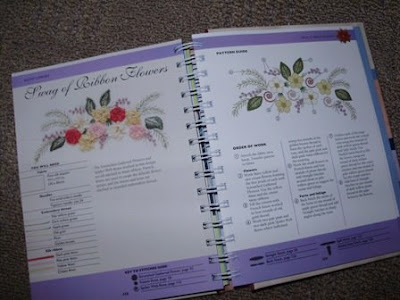 I'm so excited in just leafing through the book and now I need to plan some stitching right away. This reference book is 8 x 6.5" which is a great size for putting in my stitching basket. It also lies flat because of the coil binding. The book gives color photo as well as ribbon requirements for making the designs. The book is over an inch thick which means many, many designs. This book is exactly what I was looking for. Third: Well, I'm still waiting for the third ribbon related thing. I expect it'll be a something fabulous that I have to buy when browsing the Ribbonsmyth store later this afternoon. OK, it's really Strawberry Jam. But I made this on Earth Day - April 22nd so this time I'm calling it my Earth Jam. I've been making strawberry jam for years. I don't remember a time when I didn't make jam. I do make 7 or 8 small jars at a time, and when we run out, I make it again. I use frozen Jemseg strawberries that we would have picked, hulled, and froze last summer. I use the recipe in the Certo liquid box. I've never had a failure. 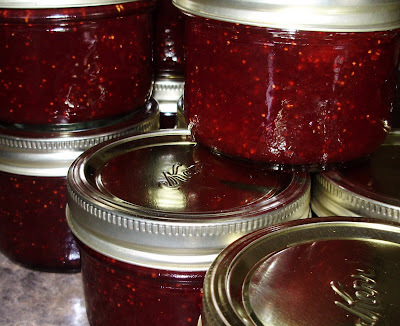 As I was making this, and knowing it was Earth day, I reflected on how many glass jars I've saved over the years by making my own jam. I guess that goes for the pickles that I make too. When doing your own manicures, you need lots of colors of polish. Do you think I have enough selection? I should tell you that I've been doing my own nails once a week for years. And for the past 2 years I've been stuck on using the same light pink color that was recommended by Prevention magazine - for 50 something girls. It's OPI's "Your Royal Shyness". It's a light pink color that is now discontinued. Anyway, it's fun to have a good choice of colors for when we have a spa evening like we did on Friday night. I was the manicurist, and I did all three of the triplets nails. We all soaked our nails in a nice warm pan of sudsy water for 4 minutes. Then I filed down and rounded each of 30 little finger nails. Then while the girls were picking out their nail polish color, I buffed Mitchell's nails and they were very smooth and manly. Then I started the girls by applying the first base coat of polish followed by the first coat of color. The minute I put the first coat on, they developed itches everywhere... on their head, on their arm, on their nose. I would not let them scratch, that's for sure. Then, it was further agony when I made them keep their hands on the island for 5 whole minutes after the second coat of color was applied. They have to learn early. It's not easy being beautiful and sometimes you have to suffer. Ha Ha. We had a fun evening. We picked out quilt patterns. Caitlin picked out a flying geese pattern that was set with dark green background with bright colored geese. Mitchell selected a blue quilt. It can be any block pattern, but he only wants blues. And Grace picked out an abstract quilt. I thought I was going to be able to use my stash, but for the most part, I'll have to buy new fabric. Help - I can't deal with my stash! I have Stash Fright! I guess it's just not me. 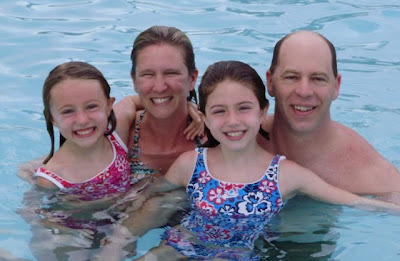 It just so happens, that Judy L. has blogged about this very subject earlier this week. Over the years, I have purchased fabric lots of fabric. I go to great lengths to store this "project fabric" in a orderly fashion. (Many thanks to Greco for the containers) I love all the fabric I buy, or I wouldn't have bought it in the first place. But now I seem to be obsessed with not sewing with it. I need to get out of this and start planning some quilts. I think the best thing for me to do is to start picking patterns, and cutting some kits. I have lots of things that I want to make and I'm afraid to cut into anything for fear that I might not have enough fabric to make the project that the fabric was purchased for. So, my Plan.... I know right off the bat, that I need to make 3 quilts. One for each the Triplets who are now 7. I was waiting until their puppy dogs were out of the chewing stage and that the kids themselves were truly out of the out of the kitty cat, or princess, or Pokemon phase. I think we're getting there. 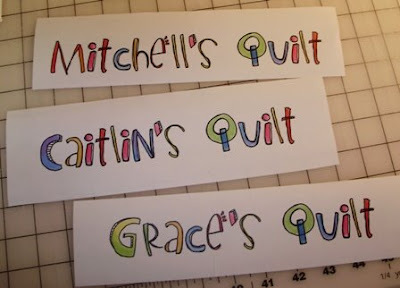 So the Triplets come for a visit overnight tonight and besides the manicures, one of the activities I am going to do with them is to have them choose the quilt pattern with me, then work with me on selecting the fabrics. 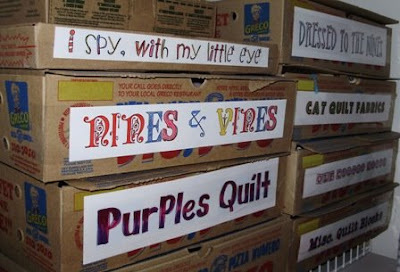 Then these fabrics, along with the pattern goes into a Greco Pizza box. I've made their pizza box labels for their picks then I'll cut a kit in the next week or 2. By doing this for 3 quilts, that will help release some of the fabric to be cut to work on other projects. Ahh, I'm starting to feel relief. I only use clean Greco boxes that never had pizza in them. If you go into Greco and ask nicely, they'll give you a box to use for your project. Last year, or was it the year before last, I was at a little lunch deli in Saint John. I was getting a sandwich for lunch and the cook came out of the back kitchen with a pot of steaming rice pudding. I haven't had rice pudding for years, but when I did have it, I loved it. So I got the rice pudding. I had a bit of sticker shock when it was $3.75 for a small bowl.. I would say half a cup. I ate this creamy, slightly sweet and cinnamon rice pudding and smacked my lips all afternoon. I gave thought to making some since I enjoyed it so much, but the idea completely vanished in time, what with my busy working girl schedule. Then, last month, Mert and I were in a restaurant and had a meal that had a light desert with it. I can't even remember where. Again, the home made rice pudding was delicious and I was surprised when Mert seemed to enjoy it even more than me. So, since we've got home from south, I've been keeping my eye out for a nice recipe. 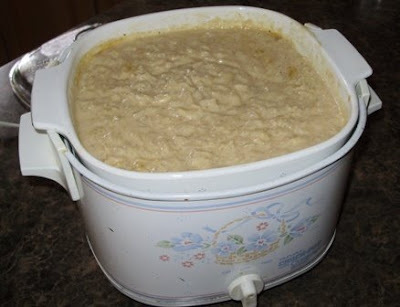 Believe it or not, this creamy recipe from a Crock pot blog seemed to have lots of raves, and I had all the ingredients in the house. So it's been cooking all day and it's on the menu for tonight. It looks and smells delicious. Want to come over for some? We seem to be on a new technology roll. First - I'm going to sell my Pfaff 2140 embroidery sewing machine. I bought this about7 or 8 years ago in anticipation of retiring. I didn't retire as soon as I thought, but I love this machine. So since I'm now 'officially' retiring as of May 2009, I thought that I will trade-up to a current Pfaff Creative model. I don't do much embroidery, but when I do, I really enjoy having it in my bailiwick of tools. I haven't purchased the new creative yet, but soon. I'll post when I get it. 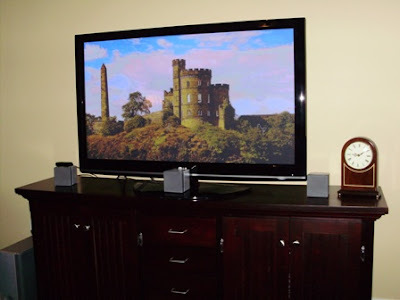 Second - Last week, thanks to a great sale at the Futureshop, we replaced our big screen TV with a bigger screen TV. It's super thin and sleek looking. We love it. We found a new channel that's called Frame. It's has Canadian photo content although the beautiful pictures are from all over the world. Beautiful pictures of the desert, covered bridges, etc and is set to lovely background music. One pet peeve I have is with this new technology is , what do you do with your center speaker from your surround sound? Originally I think the speaker was intended to sit on top of the TV, but the TV's are so thin now, it's totally out of place. I've now placed the center speaker on the stand in front of the screen, but too me it does look awkward. And when I uploaded this picture, these grey speakers just don't blend. Maybe new sleeker thinner black speakers are in order. 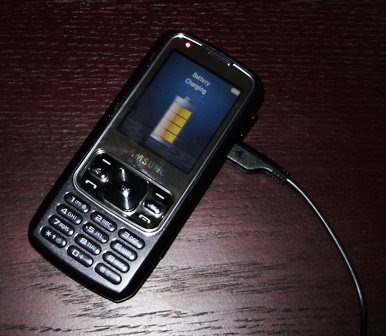 Third - The piece of tech that we purchased this week is a new cell phone. Since I am no longer working, one of the assets I turned in was my office cell phone. I don't use a cell much now, but with cottage season approaching we picked one up. So when we're at the cottage, we're accessible. We got this Samsung model that has a qwerty keyboard that springs out. It will be easier for me to text with my sister. Yes, we send about 10 text messages a year. I'm just learning about it now, and in browsing the manual, I'm realizing how cool this phone really is. If you want to,.you can do lots with it... I'm going to flag a few things in the manual to try. I wonder if it syncs to MS Outlook. If so, that would be so cool! The mailman brought me my silk-ribbon order from Hand-Dyed Fibres. Now I'm just waiting for my Silk Ribbon Bible to come in from Chapters. Then I'll be all set to do more work on my 2 socks. 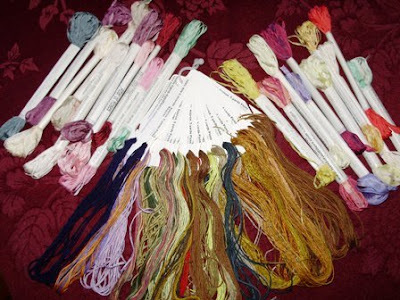 In my silk ribbon order, I selected to purchase a bonus pack of 25 5-yd pieces of silk floss. It was Pot Luck as to the colors that I would get, but for $8.00, it's worth the risk. So in it, I did get some nice colors, but over half the colors were variations of brown. Brown is not a color I use very much in crazy quilting, so I'm on the lookout for the perfect project to use up some of these browns. If you have any ideas, please let me know? Aurora has been here since Friday while her mama went to Halifax to attend a hair conference. I wonder what wacky hair do she'll give Grammie and A when she gets home. 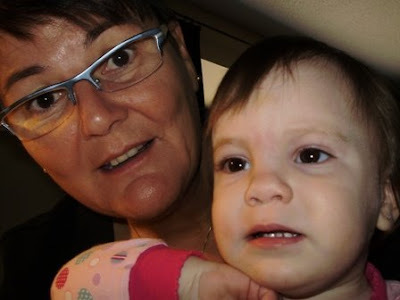 Grammie loves A's big brown eyes. I wonder where she got them from? We sat for an hour looking at all the kids pictures on grammie's computer. She is starting to recognize people and loves pointing and saying their names. She loves kitty cats too. We take her home tomorrow and grammie and grampie will rest for the rest of the week! Next weekend, I'm taking Karen Neary's Maritime Beauty class. She has been invited by a local quilt guild to teach and they had a space left. I was so glad when they gave me the space. So, I told myself, this project is going to be a true scrap quilt. 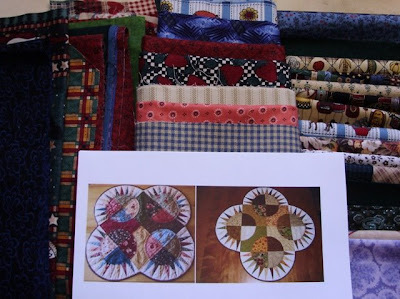 See, about 7 or 8 years ago, at my quilt guild's fund raising auction, I purchased a bag of scraps (as if I didn't have enough of my own). I threw the plastic bag of scraps in the back of my closet and look at it from time to time. As you can imagine, the scraps are really dated but just the same, it's going to be my little challenge. So I took the bag of wrinkly scraps out and sorted them into the sizes as prescribed by Karen's List of fabrics needed for the workshop. Now they are all neatly pressed and ready to pack in my workshop bag. Have you ever seen the like. 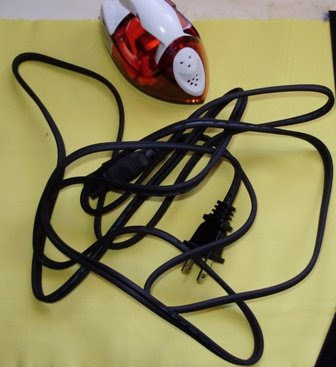 I bought a small iron to take to quilt workshops and keeping the cord in check is challenging. 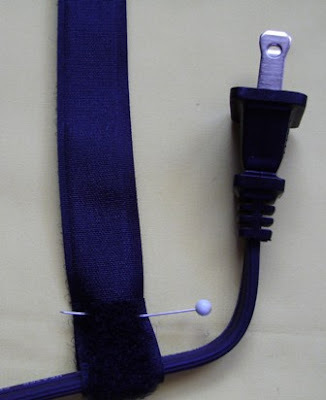 I have had this cord problem with a few things and after years of fighting with it, this is now what I do to manage these cords. 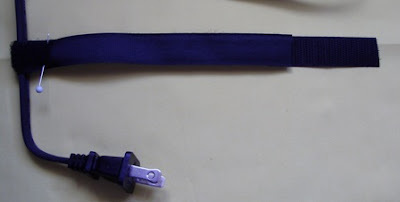 This picture tutorial will show you how I sewed 2 pieces of Velcro (aka hook and loop tape) together so now that as long as I have this iron, I will be able to manage this cord neatly. 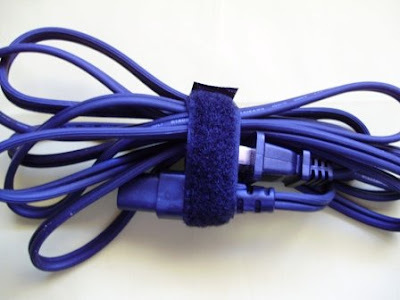 Take your 7" piece of loop Velcro facing out, wrap about 1 inch around the cord and pin as pictured. Take the 2" piece of hook Velcro and overlap about 1/2 inch with the other end of the 7" loop side. No pin will be necessary since the hook and loop will hold itself in place. Your Velcro pieces will now look like this as you take it to the sewing machine. 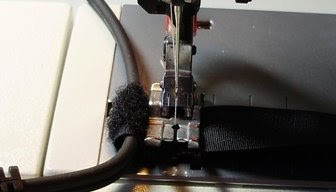 Securely sew with a straight stitch across the pinned loop side so that the Velcro slides easily along the cord. Then sew the the other end, to secure the hook and the loop sides together. 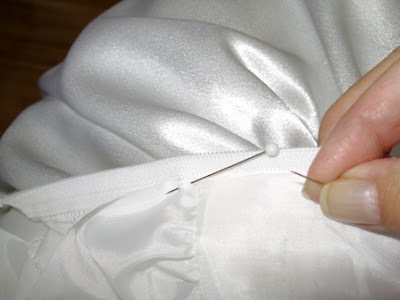 I've used white thread here to show you where your 2 short seams should be. Now you should be able to roll up your cord and wrap the Velcro around tightly so that the hook end meets up with the loop end. The cord wrap will always be on the cord even when it's in use. 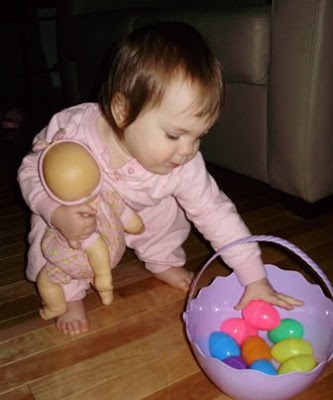 Yesterday, my sister blogged about her annual Easter Egg hunt that she organized for her kids. Well, the Easter Bunny made a simple Easter Egg hunt for Baby Aurora and she did really good. Here she is collecting all the eggs and putting them in her basket. Little does she know that in years to come, she may have to get out her toy GPS and be prepared for a more complicated hunt. The Easter Bunny no doubt will be talking to Auntie Donna to get some tips. The week has been busy. My husbands older brother, Millard was 89 when he died earlier this week. While death is sad, he had a long life and he was surrounded by his beautiful large family. This moring, the church was filled with music, tears, friends, family, laughter and love today as we sat through a beautiful funeral service and celebration of Millard's life. Pecan meal - I never heard of it! 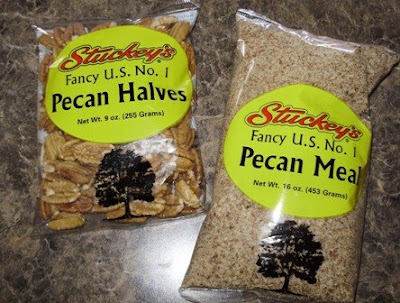 While in the Carolinas, I came across a store called Stuckey's. They seem to specialize in Pecans and had many products, mostly candy, that were made from their own grown pecans. I spoke to the cashier and asked about the nuts. I told her my sister loves pecans and she said "What is your sister's name?" I told her Donna. Then she went on and on how Donna would like these nuts, as if she new Donna. So I got them. Then the husband of this girl came out of a back room and caught the the last bit of the conversation as I was putting my change in the pocket. He said, "if your sister is really a pecan lover, she would be disappointed if you didn't bring her some of this to try" and he handed me this bag of Pecan Meal. He said most people cook sweet things with it, but he said, if you put some in the coating of your southern fried chicken, or corn bread, you'll be very glad you did. Well, I didn't like to say, "We're from the North, and we would never make southern fried chicken, or cornbread for that matter", but I thought it would be a unique and different sort of gift for my little sister. So I bought it with a short comment, "Really, how nice". I know Donna will probably eat the fancy half pecans right out of the bag, but it'll be interesting to see what she does with the Pecan meal. 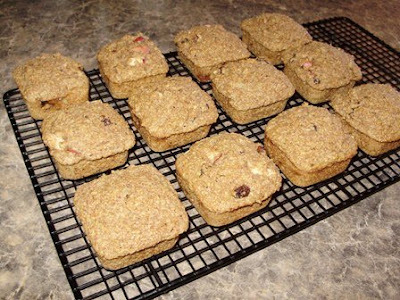 Yes, these are square muffins. 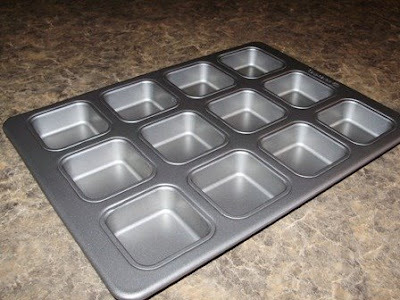 The minute I saw this square muffin tin while in South Carolina, I knew I wanted it. I love different kitchen gadgets and I had never seen this before. I think it's intended to make simple stacked elegant deserts or blondies. I'll browse the internet to see what I come up with, other than my heart healthy muffins. We're back in Freddy Beach and loving it. No pictures to show you unless you really want to see another snow picture. We're spending the day unpacking, laundry, grocery shopping, hearing aid maintenance etc. Oh, it feels good to be home. Did you know that even if you're not home for a month or so, the dust still collects on surfaces. Who knew!!!! Today, we're on our way home to the cool weather. As Jessica used to say, "When it's time to go, it's time to go". And for us, it's been 2 months and it's time go go. We're ready to see everyone at home again. We're leaving the Greens here in Orlando to have fun in the pool all by themselves. We'll see them and you all next week! 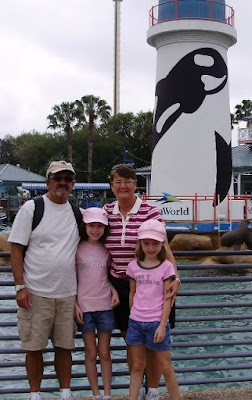 Seaworld was great. Shamu was up to his old tricks. Splashing the audience and doing back flips were what got the audience cheering! Jessica and Emily were amazed at the tricks that you can teach these giant mammals to do. It's a wonderful place. Jessica and Emily stayed with us last night and all the talk was of Shamu and the dolphins. We told Knock Knock jokes making up Shamu answers. Shamoo Pooo..... ha ha ha. I love that the kids laugh at my dirty jokes!